Check out Drifter Marine’s new Fiberlite Series. These nets are some of the strongest and lightest options available on to fisherman. The secret behind the Fiberlite Nets are the Fiberglass Handles. These handles offer greater strength at a fraction of the weight. They are also equipped with Ergonomic Foam Grip handles for a strong handle on the net and a holographic decal that adds the finishing look. The nets are also completely customizable to your specific fishing style and needs. 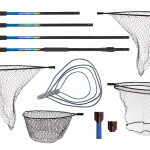 Available in four different handle lengths, four various hoop sizes, two yoke options, and four different bags to chose from, there are countless combinations so you can build the net to exactly what you need. Feel free to browse our online store that offers our full line up of marine and fishing products.